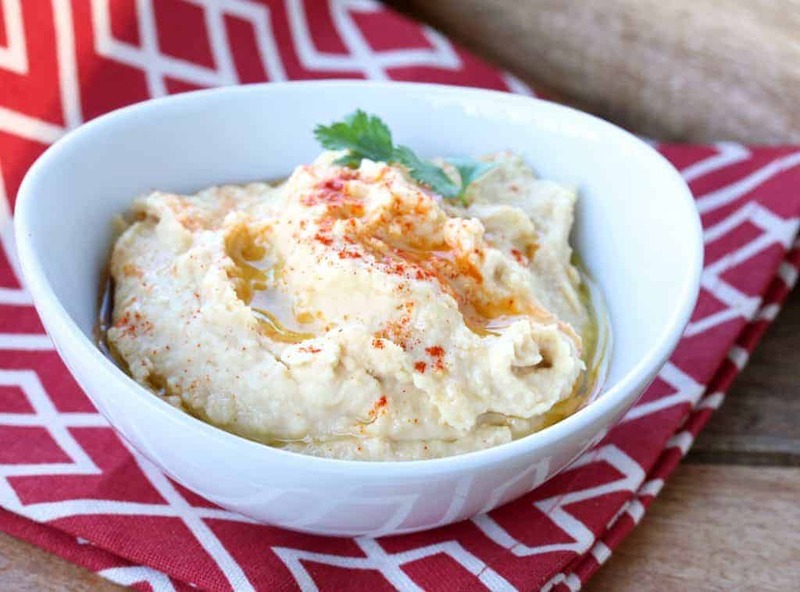 A widely popular dip, hummus is not only delicious, it’s super healthy. 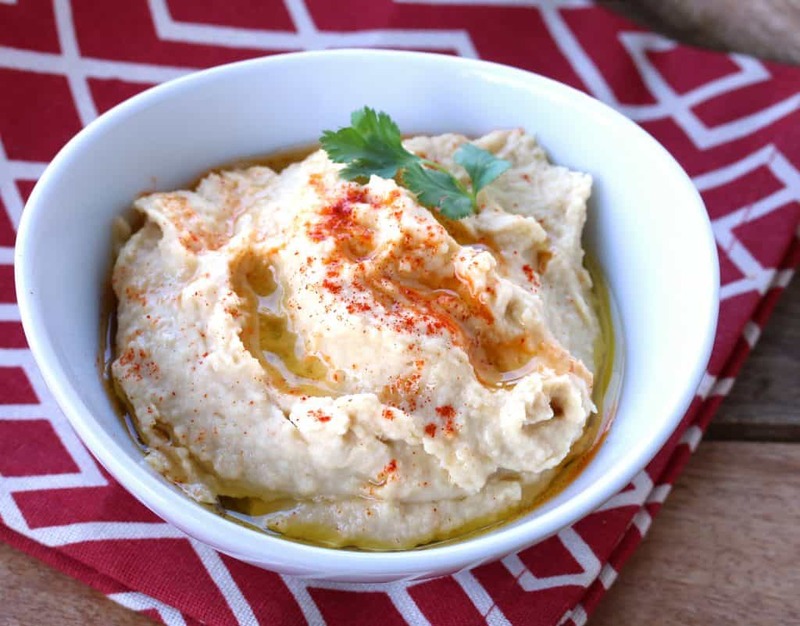 This hummus is made using homemade tahini paste, which is easy to make, cheaper than store-bought, and tastes so much better! Hummus is the Arabic word for “chickpeas”, the central ingredient in this Middle Eastern dip. 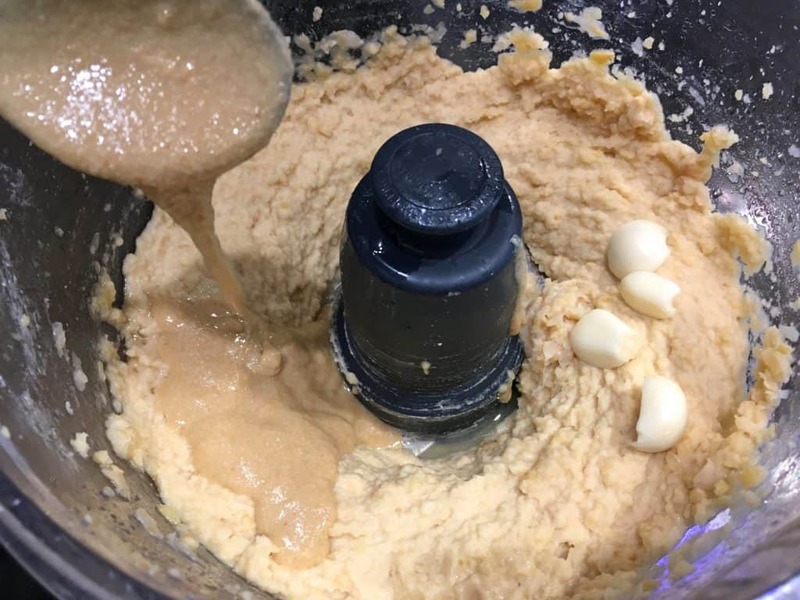 Its complete name is hummus bi tahina, meaning “chickpeas with tahini.” Made with chickpeas, tahini (a paste made out of sesame seeds), garlic, lemon and olive oil, hummus is very nutritious. It’s high in iron, vitamin C, folate and vitamin B6. It’s also an excellent source of amino acids, fiber and protein. In fact, when eaten with bread, hummus is a complete protein. And of course the generous amount of olive oil in the hummus comes with its own wide range of health benefits. And how often is it that something so healthy also tastes so doggone delicious? Most commonly served as an appetizer or dip, scooped up with flatbread such as pita, hummus is also a common accompaniment to grilled chicken, fish, falafel, and eggplant. Interestingly, “according to a 2010 market research, hummus consumption in the United States has increased by 35 percent over a period of 21 months, with sales reaching nearly $300 million” (Wikipedia). See, the masses are catching on to this delicious treat. But rather than buy it, make it yourself. It’s cheaper, fresher/healthier, and tastes so much better! And I know what you’re thinking. “Yeah, but it calls for tahini paste and I never have that on hand when I need it.” Fear not! Here’s a super quick, super easy recipe for it! Now, if you’re a hummus fan, imagine how amazing this tastes having made everything, including your very own tahini, from scratch! And if you’re not already a hummus fan, prepare to be converted! 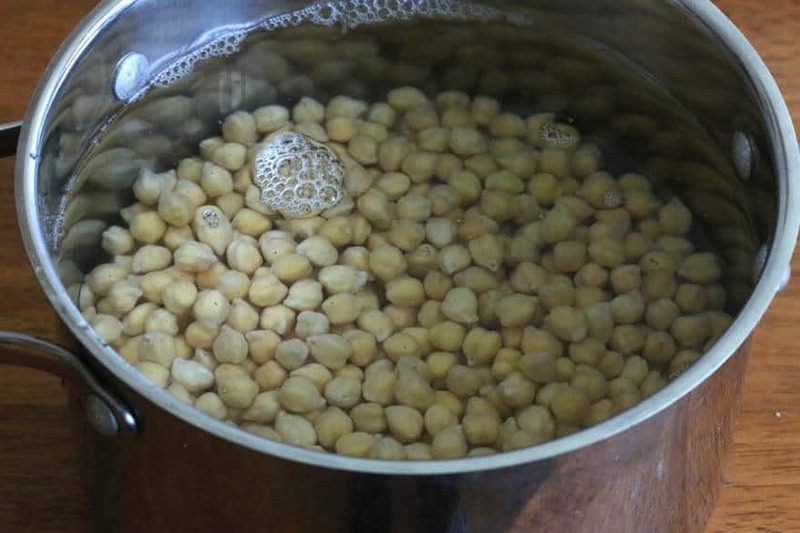 Soak the garbanzo beans in water overnight. Drain and thoroughly rinse. Bring them to a boil in a pot of water (you can add a teaspoon of baking soda to the water if you’re prone to…ahem…gas). Reduce the temperature to medium, cover and cook for 1 to 1 1/2 hours or until very soft. 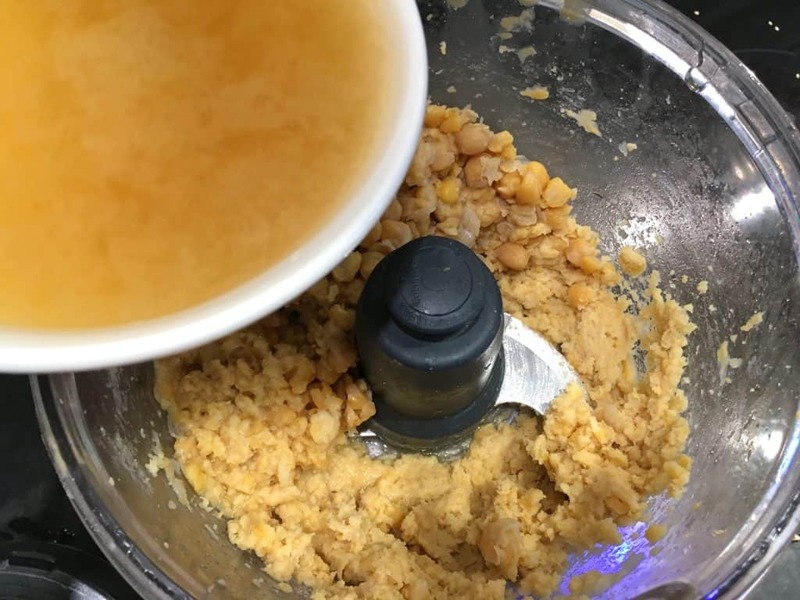 Place the cooked garbanzo beans in a food processor. I’m using my full-size Cuisinart in the photos but usually I prefer my smaller Cuisinart 3-cup Food Processor which we’ve had for 10 years and it’s still going strong. Process the garbanzo beans and add some of the reserved bean water. Add the olive oil, tahini paste, garlic, lemon juice, cumin (if using) and salt. Process until smooth. Add some more of the reserved cooking water from the beans until you reach the desired consistency. Add more tahini paste and salt to taste. Transfer to a serving bowl, make some swirly divets on the top and pour a little olive oil over it. Sprinkle with some paprika and garnish with some chopped fresh parsley if desired. Serve with toasted pita wedges, vegetables or crackers. 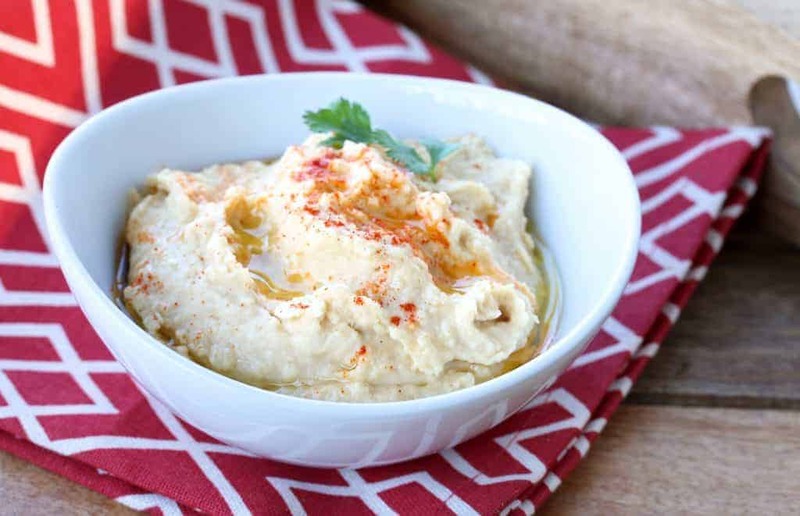 With a perfectly creamy texture and wonderful flavor, hummus makes the perfect healthy snack! Drain and rinse the garbanzo beans. Place in a pot with water and bring to a boil. Add a teaspoon of baking soda if you're prone to gas. Reduce the heat to medium, cover, and cook for 1 to 1 1/2 hours until the beans are very soft. Drain and let cool. Place the garbanzo beans in a food processor until no large chunks remain. Add the tahini paste, olive oil, lemon juice, garlic, cumin and salt and process until smooth. Add some of the reserved cooking water, a little at a time, as needed until the desired consistency is reached. Add salt to taste. Transfer to a serving bowl and make some swirly divets on the top. Drizzle some olive oil over it, sprinkle with some paprika and chopped fresh parsley if desired. Serve with toasted pita wedges, vegetables or crackers. Sounds wonderful. But cilantro???? The garnish you show is parsley, and from what I learned from my Lebanese boyfriend a zillion years ago, parsley is the appropriate garnish. At least the for the Lebanese version. The Lebanese version also does not have cumin in it, so for people who don’t care for the flavor of cumin, it is okay to leave it out. :-) One of my all-time favorite lunches is pita with hummus and string cheese. Yum! Ah, thanks for catching that typo, Susan. Yes, parsley is what I used and parsley it what it should read. As for the cumin, there are different versions with ever-so-slight variations throughout the Middle East and I can’t speak for the Lebanese version specifically. I don’t usually add it, but it does add a nice, rounded dimension of flavor. yes I think she got confused because it said parsley at top but cilantro /coriander at bottom and I agree,cumin is a no- go we are not attempting refried Mexican pinto beans with cilantro from San Antonio Texas. I really liked her recipes other than the Cumino I get enough of that here in Texas. I just might have to try the cumin sometime. 1/4t would probably be quite nice and certainly would not overpower the dish. Thanks for the info. That’s awesome, Patricia, thanks for making both recipes and for your feedback! I’ve sworn off store-bought tahini forever as well. The homemade stuff just tastes so much better! I had tahini paste on grocery list for a recipe my husband didn’t want to wait while I looked for it and didn’t want to pay for it. Thank you so much for recipe as well as the bonus humus recipe sounds so easy to make Pinned it and sent link to my kids who I know love humus. One question though; Can humus be frozen? Yes, just use enough olive oil until you’ve reached the desired consistency. I haven’t tried freezing it before – there’s never been a need because I only make small quantities at a time. Thanks for the compliment and I hope you’ll visit often! Ever since my kids discovered that they like hummus, I make it a couple of times a week. I use canned garbanzo beans for the sake of convenience but would certainly consider soaking and cooking the dried ones. If I cook a large batch of garbanzos, say two pounds at a time, will they keep in the fridge for a couple of weeks, or, even better, can they be frozen? Thanks. Hi Marc! Cooked and drained, the garbanzo beans will keep covered in the refrigerator for only 3-4 days but yes, they can be frozen for much longer, at least 2 months. Cook, drain and pat dry to remove as much moisture as possible then place them in ziploc bags, single layer so they don’t stick together, and freeze them. Alternatively, you can spread them out on cookie sheets first, freeze for an hour, then dump them into ziploc bags (now they won’t stick since they’re already partially frozen). Happy hummus making! I made the Tahini sauce and the Hummus using your your recipes and they turned out perfect! Do you also have a recipe for falafales? Good morning – I’m a fan of of your hummus and tahini recipes and now that I’m reading through comments I’m going to search out to see if you have (almost 2 years later) posted a falafel recipe! Thank you – so gooooood. 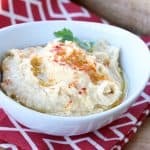 My family loves the hummus and it’s so affordable to make! So funny, Christine, another reader just mentioned the same thing on a different post! Yes, I’ll work on that falafel post :) So glad you like the hummus and tahini, thank you! Hi, I have read a few recipes for making hummus and it say that you don’t have to cook the chickpeas. And yours say it does. Does it matter if I cook the chickpeas or not? Hi Thienan, if the chickpeas are canned they’re already cooked and do not need to be cooked again. This recipe calls for dried chickpeas (not canned, not yet cooked) and those need to be cooked. You can, however, use canned chickpeas instead if you prefer and skip the cooking process. Hi, what would be the duration using a pressure cooker instead please? Thanks. I don’t know, I’ve never used a pressure cooker for this. Sorry! 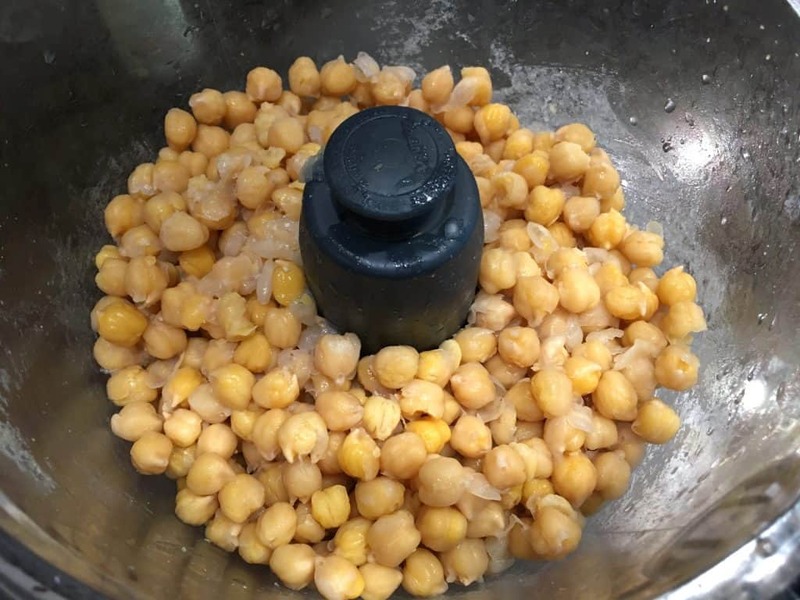 When using a pressure cooker about 5to 7 minutes after the first whistle goes is generally enough to cook the chick peas if they are pre-soaked. Perfect, thanks so much for that information, B.K.Sapra! Thank you for your recipes. I’m excited about trying the tahini paste. I live in a small town and cannot get tahini here. The closest is 2 hours away. Hummus without tahini just does not taste the same! But I did find a jar of sesame seeds. Better than nothing! Hi Amber, you’re going to love how easy it is to make your own and how much better it tastes! Let us know how it turns out! Wonderful, I’m thrilled to hear they were both a success! Thanks so much for the feedback and friendly greetings to Ireland! Hi! can sesame oil be a substitute for tahini paste in making hummus? Hi Pam, yes it can. Sesame oil is very concentrated in flavor though, so start by adding just a teaspoon at a time and taste the hummus until it tastes the way you want it to. How can I do this without a food processor? Would it work simply to mash the chickpeas? Hi Alan, yes, you can mash them by hand but the hummus won’t be as smooth. But if you’re fine with chunky hummus, then no problem. 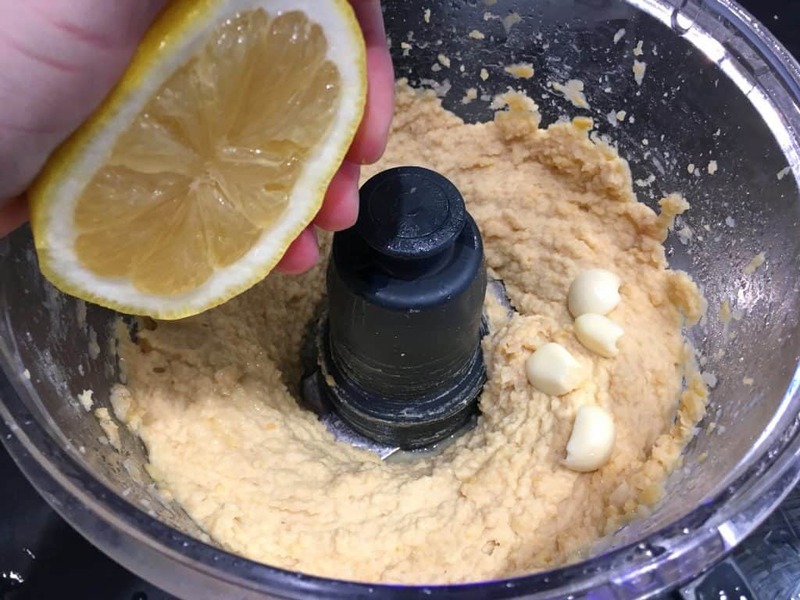 Hi Kimberly, I just made some hummus using your recipe including the tahini, although I had some difficulty with the consistency of the tahini. The dish was delish. Thanks a whole bunch. So glad you enjoyed it, dr. pepper! 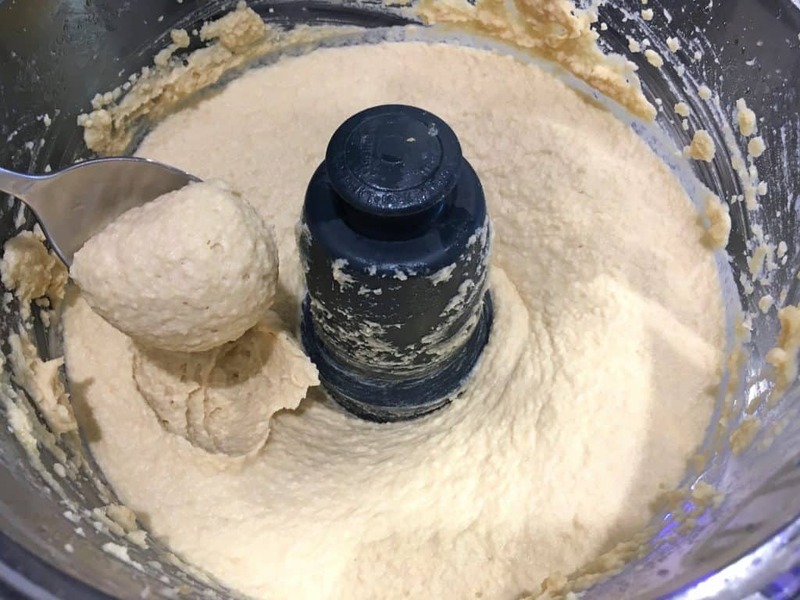 Making the tahini yourself can result in a paste that’s a little gritty unless you have a really good food processor (even then it can still be slightly gritty), but it isn’t noticeable once you mix it into the hummus. You’re very welcome and thank you for visiting! Hello – made your tahini paste and your hummus, minus cumin. Tastes a little bitter – my fault as I must have got the balance wrong. I really did only toast the sesame seeds very gently until golden, so it can’t be that. So, what do you suggest I add – more chick peas (I used canned) ? It’s so close to good, I would appreciate suggestions. Hi Carole, did you use hulled sesame seeds? Unhulled seeds will be bitter. Tahini will have a slight bitter taste regardless, “slight” being relative of course. I would suggest simply using a little less tahini or adding more chickpeas – same result either way. Thanks for sharing this recipe! Just made hummus, and it is soooo good!! Fantastic, I’m so happy enjoyed it – thanks for the feedback! Just bought all the needed ingredients to make a tahini paste and hummus. now cooking the garbanzos for the hummus. Then will toast the sesame seeds for the tahini paste. First time i will make both. I worked in Saudi before and I just love hummus! Will share how it will turn up following the instructions. Great, let us know how it turns out, Jessie! Great, Kimberly! My family loved it! Used it for dipping and as spread as well! Fantastic, Jessie, I’m so glad to hear it – thank you! Hi Cheryl, you’ll need about two 15 ounce cans. Great looking recipes…Can’t wait to make the tahini, and I’ve never made hummus using chickpeas I cooked myself so I’ll give that a go as well! I was wondering though, if it’s still ok to use the cooking liquid if I put the teaspoon of baking soda in it – to eliminate gas(?)…Thanks! Thank you! And yes, it’s no problem at all to use the liquid with some baking soda in it. I just made hummus with the tahini paste and it left a chalky dry aftertaste. I stuck to your recipe and I can’t figure out what went wrong. Any suggestions for improving the taste? I’ll really appreciate the help. 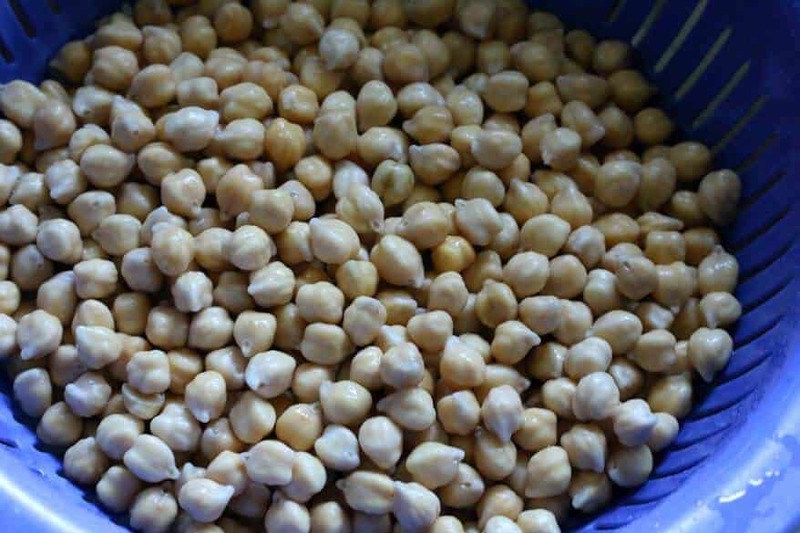 Hi Sumedha, it sounds like undercooked chickpeas – they’re terribly chalky if not fully cooked in the center. Depending on the age of the dried chickpeas they can take much longer than usual to cook. I love this recipe so much. My picky eater daughter loves it, as well. I linked this page to a post on my blog, so others can come to your page for it. Thank you for sharing! Thanks so much, Sherry, I really appreciate that! Hello Kimberly, Thank you for posting this recipe. 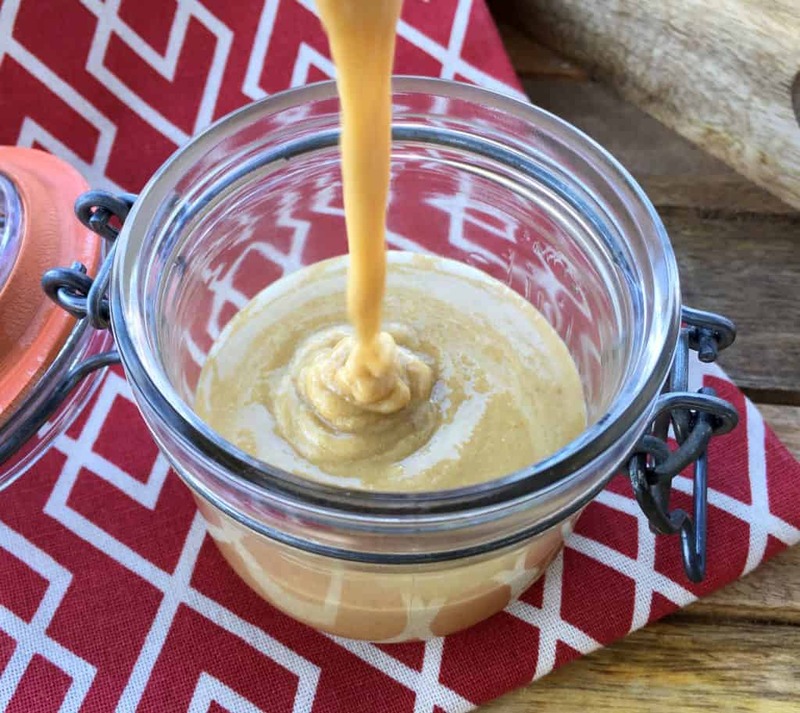 I was researching how to make your own Tahini when I thought “If I’m going to make my own hummus, why not find out how to make the Tahini.” So I’ve read both of your post since I found them on Google. I had recently emailed myself another recipe for hummus but I like the thought of yours better. I will be making my own Tahini and Hummus soon and will let you all know how it turned out. Again thank you for sharing. 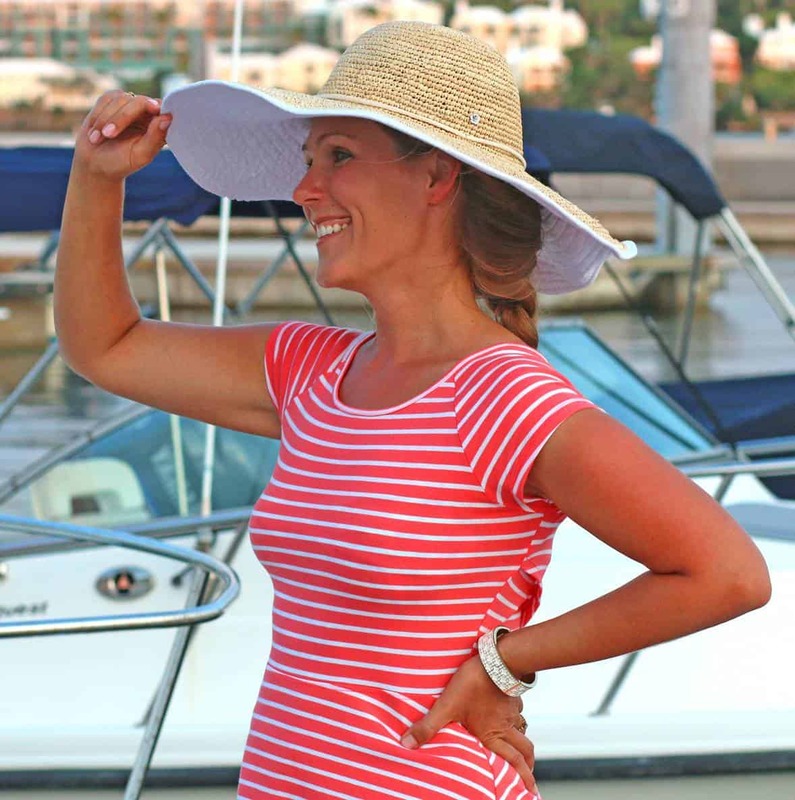 Wonderful, thank you and yes, please let us know what you think! awesome recipe, thank you! i love garlic so i added more minced cloves to the final product until it was garlicky enough for my taste. i think it came to a total of 5 cloves in the whole dish. Fantastic, Meepo, I’m so glad you enjoyed it – and hooray for garlic! Thank you. I just did hummus for second time and it is far better with tahini ftom scratch. Thanks, Baba! I agree, the flavor is bolder and better, no comparison to the store-bought stuff. Thank you so much for your post on home made tahini as I do t want to have to go to the grocery store to get some and I tend to keep a lot of toasted sesame seeds at home for Japanese cooking. Excellent recipes. Thank you so much. I can’t wait to browse the rest of your site. I have been making hummus for years, but never my own tahini. Now I have to ask myself – why not? Especially since I have both a food processor and a vitmix :-) As for the comments about the cumin. I always add it, it gives better depth of flavor. You don’t have to add a lot. Smoked paprika on top is nice too, or Za’atar which is a Middle Eastern seasoning with sumac, sesame, and thyme (also good sprinkled on grilled pita breads). Thanks, Sherry! For sure, all of those seasonings add a wonderful touch of flavor. Why both tahini and cumin? Isn’t that redundant? Hi Kim, tahini and cumin are two entirely different things – tahini paste is made out of sesame seeds and cumin is a spice. Thank you, Kim! I just made it tonight and it was amazing! It was my first time making homemade hummus and I love it! And yes, it was no comparison to the store-bought one, it was fresher (and cheaper, lol) and I have control over everything I put in (I made it minus cumin and less olive oil). Anyway, thank you very much for your recipe! Love you! You absolutely can not beat Lebanese houmous, all other houmous is just an imitation. Most of what you buy in the supermarkets is cannibalised horribleness, too creamy, flavoured or made with all sorts of cheap oils. Chickpeas, Garlic, Lemon, Water, Tahini, Salt and that is IT. Nothing else at all. Oil (quality olive oil that is) is ONLY used to dress it before serving. This is a fantastic recipe, thank you. I tried making houmous in the past and just couldn’t get the texture or flavour right and this is perfect in every way. I will be making this recipe for years to come! I’m so happy to hear that, Bernadette, thank you! Your tahini and hummus recipes are excellent,..thanks.